Custom Stencils – Custom Mylar Stencils you can design in your browser. Create your own custom stencil on your web browser. Click on SHOP in the menu for the options.For the best results editing the stencil it is better to use a Desktop/Laptop rather than a phone or tablet. Stencils can be shipped to the UK, Europe, USA, Canada and Australia. For any other countries please contact me. All stencils are made in a durable mylar plastic and are a 190/250 micron thickness depending on the use. 250 micron is better for repeated spray paint use and 190 micron is better for detailed sponge or stippling brush use. 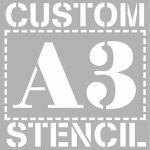 If you use our design tool to design the stencil then we will use the design as a guide for creating the stencil, if you have problems lining up text or positioning text we will adjust the design to make sure it looks as professional as possible before cutting. 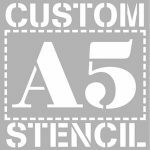 If you prefer to make the design yourself using a design software or Word or Illustrator etc, then contact us first for guidance before purchasing the stencil. We can only cut letters above 10mm in height. If you have a company logo which you would like made into a stencil then contact us for a quote before purchasing. Not all logos are suitable for stencils so check with us first. 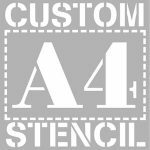 We have been selling stencils on ebay and amazon for years and have thousands of positive reviews for the stencils we produce. You can be confident we will make the stencil to the best standard possible.